Marigolds are popular plants among city planners and commercial landscapers. They’re bright and cheery, they’re easy to grow, and when the bugs come calling, they have a really nasty surprise hidden in their roots. Some companies use ozone as a decontaminant, and marigolds do as well. Ozone is an oxygen atom in triplicate; it is what’s known as “reactive,” which means it reacts with other molecules the way a boxer reacts with his opponents’ faces. At the very least, ozone rearranges molecules. Often, it rips them apart. This is bad news for any animal, but especially for small animals, for whom a few molecules mean the difference between life and death. Scientists first got suspicious about marigolds when a group tested to the effects of heightened ozone on plants. 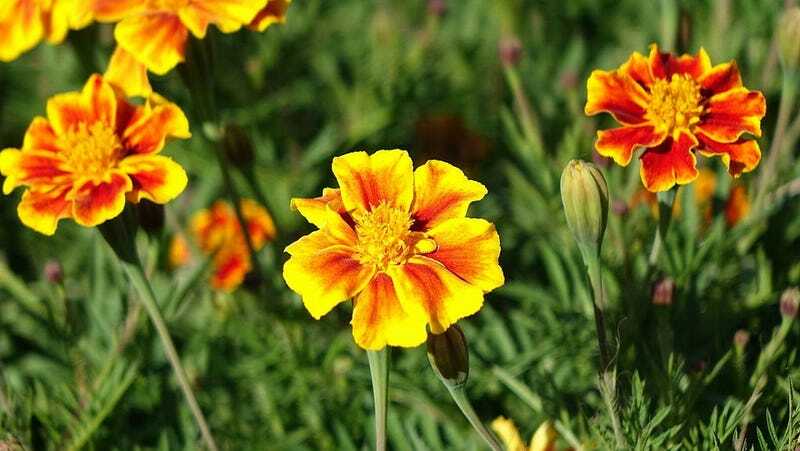 While some bedding plants and radishes produced far less biomass when exposed to ozone, marigolds sailed through the experiment without any noticeable effect. If anything, the heightened levels of ozone may have taken the pressure off the marigolds to produce ozone of their own. Sink beneath the surface of the soil anywhere near a group of marigold, and you’ll find it pumped full of ozone. The roots produce it to kill off any nematodes that get a little too close. Which is fair enough. It’s only reasonable to expect something to push back against anything trying to make it a snack. The roots aren’t content to only attack the predators that go after them. Marigold roots put chemicals that attract the very nematodes they kill. They lure the worms in, and then gas them to death. Those are some nasty flowers.